These days, when the ladies and I try to organise a night out, it takes a lot of effort and meticulous planning! We’re all incredibly busy women and so it is hard work to get everyone together on an evening out. Many, many Whats App messages exchanged later and we usually finally have a date in the calendar and a table booked in town at one of our favourite restaurants! I absolutely love going out with my friends in the evening and catching up with them. During the weekdays it is hard to chat to them properly on the school run (or when dropping/picking children up for parties at weekends) and so getting together over cocktails, wine and delicious food is ideal. We usually mostly talk about the children – but at least we can usually have a giggle and a gossip too! 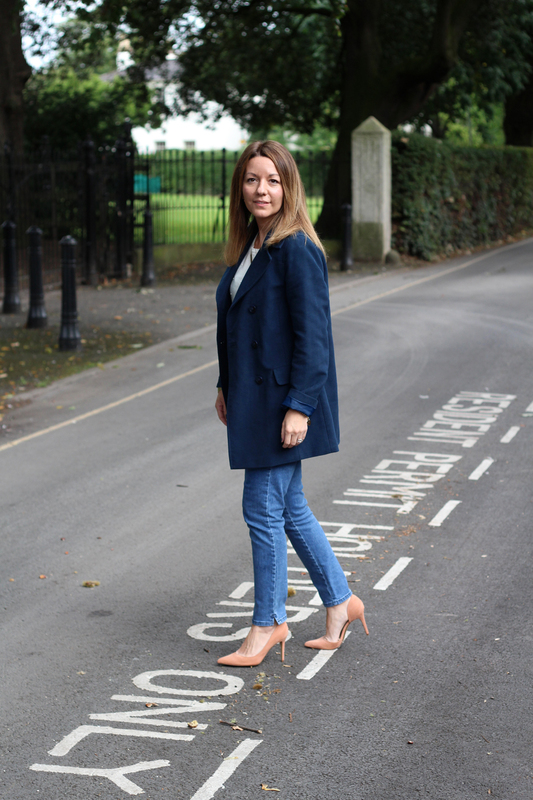 I am a busy Mum of young 5-year-old twins and so I don’t often get to wear heels much these days. Thus when there is a chance to get dressed up a little and feel smarter I jump at the chance! When I go for dinner with the girls I like to wear something that I feel smart in, but that also feels casual too. 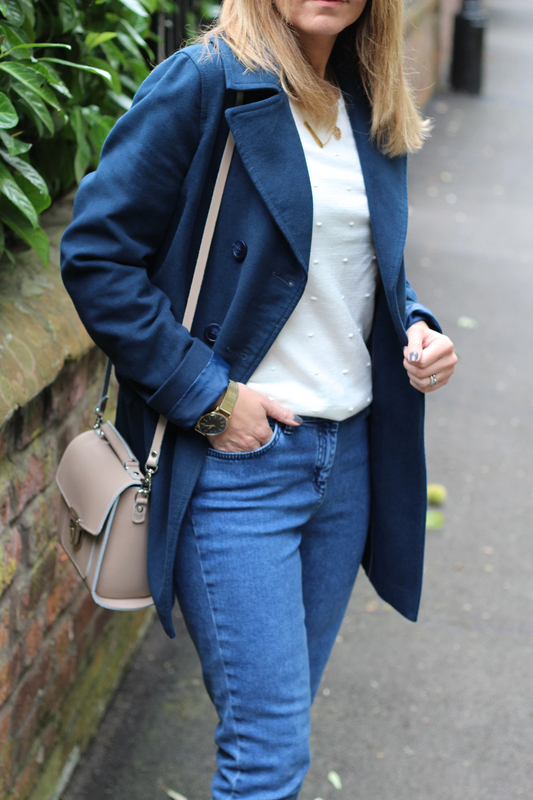 I am such a big fan of the classics and typically always go for the colours navy, white, blue and grey because they go with everything and it’s much easier to get dressed when you have items in your wardrobe that complement each other. 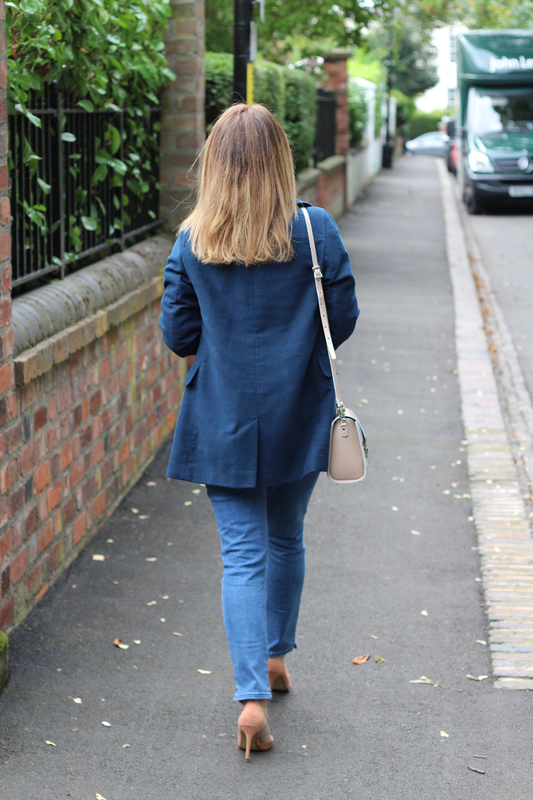 I absolutely adore these blue-cropped slim leg jeans. 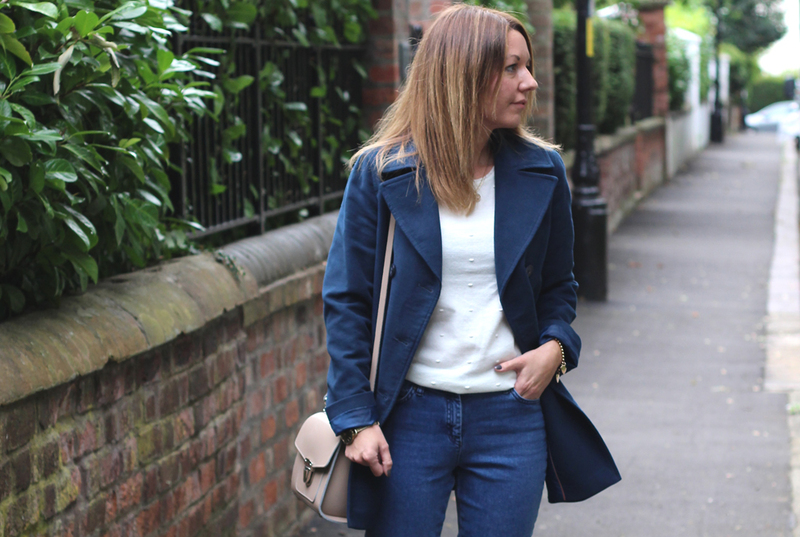 Although they are really on-trend for this season (cropped jeans are all over the high street right now) they are really comfortable too. What I love the most about them though is that they will go with anything in my wardrobe; they’d also be perfect with trainers too for the school run in the morning. This long sleeved dotted white jumper is lovely and light for these slightly warmer autumn days, meaning I don’t feel too hot or stuffy in it. The dotty detail just gives it a nice finish and extra texture to a plain knit. The double-breasted moleskin coat, however, is my favourite piece of this whole look. I wouldn’t normally go for the colour teal when shopping for autumn/winter coats and yet I love this one. 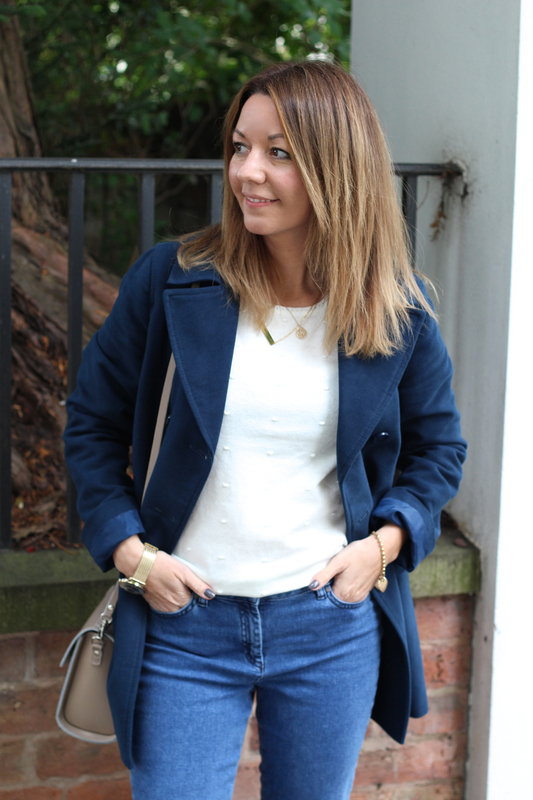 This coat goes perfectly with jeans or black trousers, as well as tan or pink accessories. Again, I could absolutely wear this with a more casual outfit on weekends with the family such as a baggy sweater and ankle boots. The best thing about Laura Ashley clothes though is the quality. They seem to fit me really well and always feel luxurious on. Now I’m off out to enjoy my evening!